Samsung Electronics today introduced its expanded SAMSUNG ARTIK™ Smart Internet of Things (IoT) platform featuring two new module families, ARTIK 0 and ARTIK 7, new device management capabilities in SAMSUNG ARTIK™ Cloud and an expanded partner ecosystem. The result is a complete IoT development solution to help companies take their IoT projects from concept to reality in record time. According to a recent research study by 451 Group, 65 percent of enterprises are using the Internet of Things (IoT) to optimize their services and product offerings. With the SAMSUNG ARTIK platform, many of these enterprises now can build IoT solutions to further transform their businesses and enter new markets. 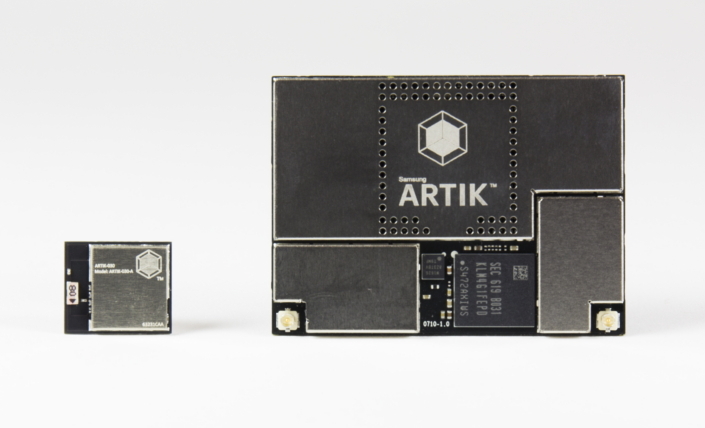 ARTIK 0 family: The ARTIK 0 family of modules enables low-power, lightweight, cost-optimized devices targeted at end-devices including HVAC, lighting, industrial sensors, personal health monitoring and more. The modules are built on power-optimized ARM® Cortex®-M microcontrollers and support low-power wireless standards, such as the ZigBee®, Thread®, or Bluetooth® Smart standards. They save customers time and money by providing a complete connectivity solution, including networking stacks, radio frequency (RF) components and precertification for regulatory approval. ARTIK 7 family: The ARTIK 7 family of modules is intended for high-end gateways and multimedia applications. With an 8-core 64-bit Cortex A-53 processor, the modules work well as gateways and also allow customers to run local analytics, which enables offloading of cloud computing locally to boost latency and responsiveness. The ARTIK 7 module provides unrivaled connectivity, with built-in Wi-Fi, Bluetooth, ZigBee, Thread and GbE MAC interfaces. It has a high-end multimedia processor for video and audio processing. The pre-installed Linux® operating system (OS) speeds time to revenue by providing a powerful OS supported by an extensive developer community. The ARTIK 7 module is RF pre-certified and features enterprise-class security. SSIC is a global organization within Samsung Electronics Co., Ltd. focused on innovation and new business creation, headquartered in Silicon Valley and with offices in Korea, Israel, France, and the U.K. SSIC’s mission is to develop and accelerate disruptive technologies through open innovation, investments, and acquisitions by working in collaboration with entrepreneurs and strategic partners to enhance people’s lives and to help make the world a better place.